Ancient chemistry with Dr. Koh! 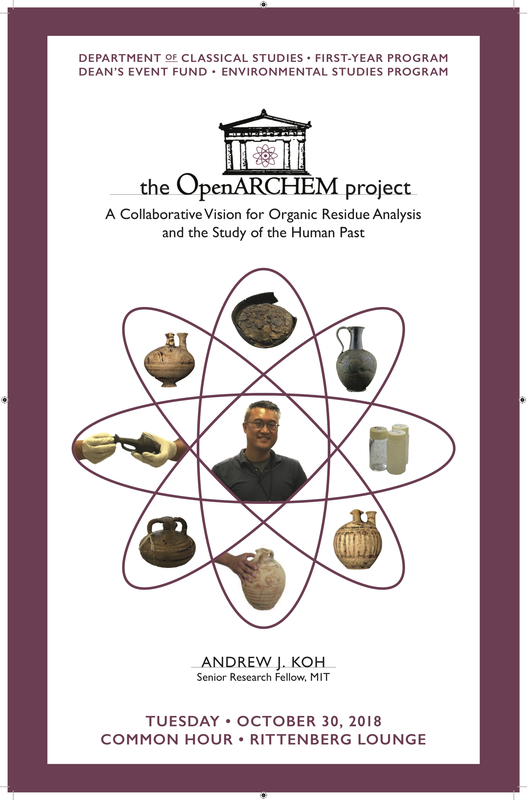 On Tuesday October 30 2018, we were pleased to welcome Professor Andrew Koh, a Senior Research Fellow at MIT, who gave an insightful lecture on organic residue analysis and the study of human history. Afterwards, Dr. Koh visited one of our First-Year Seminars (Medicine and Health in Ancient Rome, taught by Professor Caldwell) and let us in on the ins and outs of the culture of research labs and explained how classical studies can give us a unique perspective on our own time by providing a platform of data for us to examine the social, political, and legal ramifications of subjects such as environmental fluctuation. Just as we are now facing a troubled global climate altered by excessive human interference, Dr. Koh reminded us that the Romans too had instances of this phenomenon in their history. For example, by studying the Romans’ harvesting of millions of marine snails to make their coveted regal purple dyes, we can draw parallels to modern overfished aquatic populations such as tuna, and take lessons from how the Romans dealt with these resource shortages. Thank you for the insightful visit, Dr. Koh! This entry was posted in Uncategorized on November 9, 2018 by vtomasso.